Home / Comic Reviews / Comic Books / Can’t We Talk About Something More Pleasant? 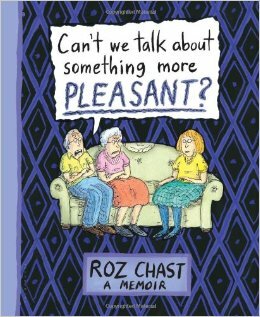 Almost exactly in the middle of New Yorker cartoonist Roz Chast’s Can’t We Talk About Something More Pleasant? (2014), the reader is confronted with photographs of her elderly parents’ many belongings: eyeglasses, Life magazines, kitchen appliances, vintage purses (109-119). The snapshots’ central placement in the text mirrors the location of the Chasts’ “Crazy Closet,” the Brooklyn apartment version of an attic, in their home. Completely stuffed with the artifacts of her parents’ shared life, the Crazy Closet becomes Roz’s responsibility after her parents’ growing health issues necessitate their move out of Brooklyn to a Connecticut eldercare facility. Dealing with the accumulated detritus of over fifty years proves too intimidating a task for Roz to undertake. After selecting a few mementos, she leaves the rest. But the Crazy Closet signifies more than just junk—it is a reminder that the most difficult responsibilities of parental eldercare cannot be left to building superintendents. As an only child, caring and worrying for her parents becomes Roz’s bequest, one she has ambivalent feelings about. Can’t We Talk About Something More Pleasant? follows the Chasts’ move out of the Brooklyn apartment where they had spent the great majority of their lives and into the suburbs, and more specifically, into a “Place” (an apt euphemism for a facility whose fancy trimmings never seem to cloak its bond with death). While Roz loves her parents, the family’s increased interaction is accompanied by sharp reminders of her unhappy youth, constantly feeling left out of her parents’ codependent orbit. Chast’s signature style—scribbly drawings and spidery words—is spectacularly well-suited to tell the story of parental aging. Can’t We Talk About Something More Pleasant? is graphic, in both senses of the word. There is no romanticization to be found within the text’s pitch-perfect mix of sarcasm and vulnerability. Refusing to shy away from the uncomfortable and disgusting is part of the text’s commitment to depicting “the part of old age that [is] scarier, harder to talk about, and not a part of this culture” (20). Visually, Chast carefully captures aging’s accretive effects, from the accumulation of grime in the Brooklyn apartment to her father George’s increasingly failing memory and dependency on her strong-willed mother, Elizabeth. For example, George’s disorientation often manifests itself in his inability to stop asking questions, which flow forth from his avatar’s mouth unchecked. His confusion overwhelms the page as his avatar is slowly suffocated by his own speech bubbles—“Why am I here?” “Tell me something: where do I live?” “What happened to the apartment?” “Where’s Mom?” “How long have I been here?” (81). Perhaps the most striking part of the book is Roz’s fraught relationship with her mother, which never reaches full reconciliation. “I wish we had been closer,” Chast confides to her mother during Elizabeth’s last months. Although Elizabeth is weakened, holding on in a state of “suspended animation,” she brusquely asks her daughter, “Does it worry you?” Roz lies, “No…Does it worry YOU?” Her mother’s riposte is short and devastating: “No” (201). Chast makes clear the failure of rapprochement still aches, reflecting “if there had ever been a time in my relationship with my mother for us to get to know one another…that time had long since passed” (202). But Can’t We Talk About Something More Pleasant? is all about the potentialities of the already-too-late. The penultimate pages of the text contain Roz’s sketches of Elizabeth from July to September 2009, the final months leading up to Elizabeth’s death. The close proximity of the sketchbook drawings—rough, scratchy—silently display less tense encounters with Elizabeth. Only in the absence of words is Chast is finally able to draw her mother close. In the spirit of this uneasy intimacy, Roz closes the book with an image of her own closet, which is where she keeps her parents’ ashes. Seeing their ashes every day, she reflects, ensures she conveys her parents into the present. Contradicting her own words about the opportunity for repairing her relationship with her mother having long passed, Roz quips, “I’m still working things out with my mother” (227). And rightly so: the book itself is an artifact of the “still working”-ness of that process, one whose pleasures and pains did not end with George and Elizabeth’s deaths, but continue to shape and animate Chast’s life and work.